A couple of weeks ago I was doing some research for an article I’m writing about cycling clubs that support women for Bicycling Australia magazine, and I came across a Brisbane cycling club that’s attracting lots of women to its ranks, and working hard to support them. Kangaroo Point Cycling Club (KPCC) which might sound like it has a semi-rural bush setting is in fact based in Brisbane’s inner suburbs and has been around since 1905. It currently has over 200 members and about a quarter of them are women. I had a chat via email with Club Co-Captain Alix Everton about the great work she and other women (and men) are doing at KPCC. Q: Do you run any female only rides or other activities for female riders? Yes, we have our very popular Women Only Weekdays – rides run by women, for women, with ‘no boys allowed’. These rides are always kept at a social pace where nobody gets left behind, so that all experience and ability levels are catered for. Since we started running these rides nearly a year ago, we have developed a consistent core group of ladies who turn up, and have new women coming along to try it out nearly every week. This ride helps our club to reduce barriers to female participation by providing a welcoming, non-threatening, non-competitive cycling environment. This year we ran a ‘Women Only’ training program designed to progress women who are new to racing to gain the required fitness and skills to ride our Club’s principle race of the year – The Upperlimb.com Cunningham Classic. This program is coached by a specialist Level 2 coach who joined the Club specifically because of the focus that we have on women. We are also very excited as for the first time this year the Club is offering equal prize money for men and women for this race, as well as dedicated Women Only grades, which will make this race much more accessible to some of our newer female racers (myself included!). In late 2013 we held a Novice Women Racing Tour designed for women who want to give racing a go in a relaxed and safe atmosphere. This included three weekends of skills training, as well as simulated criterium and road racing. The Club is also working on a significant new Women Only Racing Program that we hope to launch in 2015, where we will provide a varied program of regular Women Only races that include both skills development and racing, with a focus on providing a safe, fun and supportive environment. Q: Do you think that because your club has a female club captain, that encourages other female riders to join the club? The club is well represented with female position holders across the board – in addition to myself as Club (Co)Captain, our Vice-president, Secretary, Treasurer and one of our three Club Mentors are also female. Having women in these key positions definitely helps to create the right atmosphere to attract women cyclists to the Club. I think new female members appreciate having a female club captain as their first point of contact, to help them feel comfortable and supported in coming along for a ride. Q: Why has KPCC been successful at gaining female members where other clubs struggle? One of the things KPCC does so well is listen to what its members want and quickly and effectively putting that into practice. In terms of single initiatives, the Women Only Weekdays rides has been the best for attracting new female members – other women see us rolling along having a great time in an organised and safe group, and those women think, ‘hey, that looks like fun, I want to do that’. We have also found that word of mouth is playing an increasingly big role in attracting new female members, as the cycling community is becoming more aware of the opportunities KPCC is providing for female riders. I think our friendly, supportive and inclusive attitude gives the Club rides a very welcoming atmosphere, which women in particular seem to respond to and appreciate. Q: How do you think we can encourage more women to take up the wonderful past-time of cycling? I think it’s important to provide an entry into the sport that feels safe, fun and non-threatening for women, and based on our experience, this seems to be well achieved by providing the ‘women only’ options. I also think it helps to have a social platform on which women can start their cycling journey, as I have often heard women speak of feeling intimidated or simply uninterested in racing, but still keen to get out for regular rides. However, I also think it is vital to provide dedicated pathways for women to be able to progress in the sport and to ensure that women are offered the same opportunities and levels of support that exist for male riders. Q: How long have you been riding? What inspired you to start? I have been riding for nearly three years and in the last six months have started to take part in a few local criterium races. I initially took up cycling as something to do with my husband (an avid cyclist!) and I was gradually bitten by the cycling bug to the point where I now get out on the road just as much (if not more) than him. I’ve surprised myself too by not just looking forward to the rides, but also to taking part in more races! One of the most instrumental experiences in progressing my cycling journey was definitely joining KPCC, and the icing on the cake was the introduction of the Women Only Weekdays ride, as this allowed me to grow my confidence and skills in an environment where I was not constantly just trying to hang on to the pace of the boys! This is awesome to hear! I live in brisbane, but the KPCC is located too far for me to get to on a regular basis so I joined another local club called the Logan cycling club. They too are trying hard to get women involved, but it has been a struggle. Nevertheless, whenever I turn up for their social rides, they have been very good about not leaving me behind, even though it is usually about twenty men to just one or two women (and the regular women riders are fast!). I used to feel self conscious about being unable to keep up, but the men are so encouraging that I don’t feel bad now. I wish more women would join up though. Seeing other women ride too is somehow very reassuring. I am a mature (ie over 55) member of Cams Cycle Coaching on Montague Road, West End ( in Brisbane). We have 4 groups out on a Saturday and 3 on a Sunday. We have women in each group..and never leave anyone behind. We are an indoor centre too with 48 Computrainer stations where you are coached in group or self paced sessions in various aspects of your cycling fitness. Our membership would be approx 40% female. 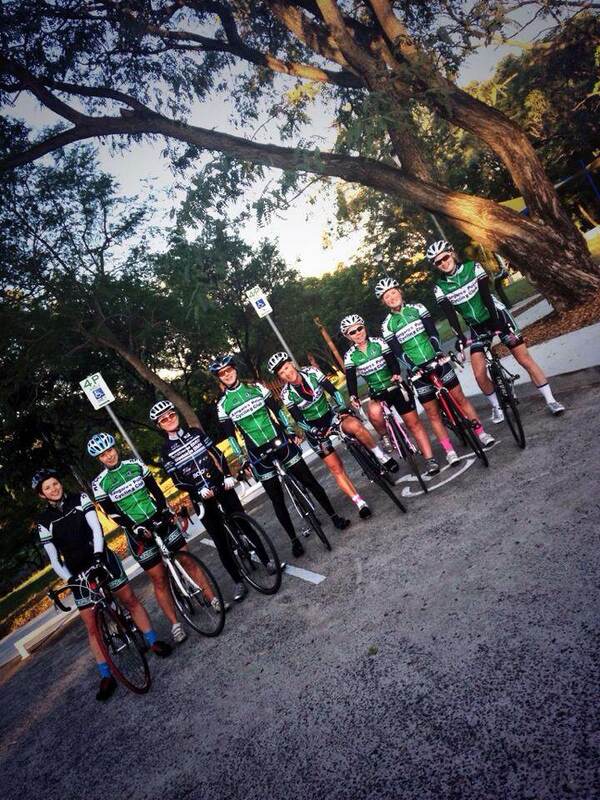 We are currently coaching the She rides program and will now be starting women only rides.